Many interior designers say lighting is the most important factor in any space. It sets the tone and mood of the room, and of course impacts your ability to complete basic tasks. This is especially true of the bathroom, where not only do you want a space where you can relax and unwind, but you want somewhere you can accurately put on makeup. Good lighting in your bathroom will also enhance any colours and textures from tiling and splashbacks, complement furnishings, and make the transition from day to night seamless. We’ve created a simple guide to choosing the right lighting for your bathroom. If you follow these tips, trends and ideas, you’ll be able to transform your bathroom effortlessly with a simple switch. The bathroom is the most humid room in your home, so all lights and fittings need to be water resistant, as well as a safe distance from areas such as the bath or shower. The bathroom is divided into 4 different safety zones. Each zone correlates to an international classification system, or IP rating, that ensures your bathroom and its electrical features are safe. 0 refers to a zone most exposed to water, whilst zone 4 (outside zone) is the least exposed. Additionally, the higher the IP rating, the more water-resistant it is. Before you even start searching for the perfect lights for your bathroom, remember that you will always need to check their IP rating first. You can learn more about IP ratings here. Ambient or general lighting: this consists of ceiling, wall, and/or recessed lights. Task lighting: this type of lighting has a specific job, like helping with grooming in the mirror or seeing in the shower recess. Accent lighting: this lighting illuminates key features in the space including feature walls or a statement bathtub. Natural lighting: utilise the sun through a skylight, or windows placed high upon a wall (so as to maintain privacy). Generally the best combination for the bathroom is a good balance of ambient and task lighting. This will help you to avoid creating shadowy areas that are a problem just waiting to happen. However, adding a little natural lighting to your home is a superb way to not only cut your electricity bill, but to effortlessly create the illusion of a bigger bathroom that is naturally bright and fresh during the day. TIP: Consider installing lights under the cabinet or in the floor for those late night bathroom trips. 3. Have you got the right bulb? Unfortunately many home renovators don’t realise that after all their hard work, not just any bulb will do the trick. You might have the perfect fittings and fixtures in place, but if you don’t have the right bulb, you won’t achieve the right lighting effect. There are a lot of bulbs on the market these days. In Australia, traditional bulbs, like incandescent lights, are slowly being phased out because of their inefficiency. So now’s the time to start considering new and alternate products that will keep your home up-to-date, and ready for these changes over the next 10 years. The right globe really depends on the shade of the light you are installing. Some bulbs have visible filaments whilst others are more hidden. Choose a bulb style that not only reflects the light well, but also reflects the style and aesthetic of the space you are creating. Wattage plays a big part in illuminating a space, which basically means it will dictate how bright or dull the areas in your bathroom are. For example,it is recommended that task lighting in the bathroom includes a 75 to 100 watt bulb. An equivalent to this would be a 24-26 watt fluorescent bulb or a 20-25 watt LED. Bulbs come in a variety of shades and tones. The most common colours are a warm to cool light, a bright white, a blueish hue, or a yellowish glow. The colour temperature of a light is measured in Kelvins. The lower the Kelvin, the more yellow the light will be. The higher the Kelvin, the bluer the light will be. When choosing the bulbs for the task lights around the bathroom mirror, choose a bulb that will create the most natural looking light possible. Too yellow or too blue, and you might have some make-up disasters on your hands! It’s super easy to find sustainable lighting alternatives. They can be bought anywhere from the supermarket to the hardware store, and depending on the type they are relatively cost effective. Fluorescent lights use 80% less energy than incandescent bulbs. The two types – compact fluorescent lamps (CFLs) and tubular lamps (tubes) – give you a broad range of shapes and sizes to choose from. They also keep spaces cool, as they only emit a small amount of heat. LED lights are more expensive than traditional lights, but have anexpected lifetime of 20,000 to 40,000 hours, and are four to five times more efficient than traditional lighting. They are also great for adding light around a sink or in a shower (and can even be added in the shower head!). Like we mentioned before, traditional incandescent lights are being phased out in Australia. So going green in the bathroom is not only fantastic for the environment, it will save you money, and will increase the value of your home by ensuring it’s ready for the future. 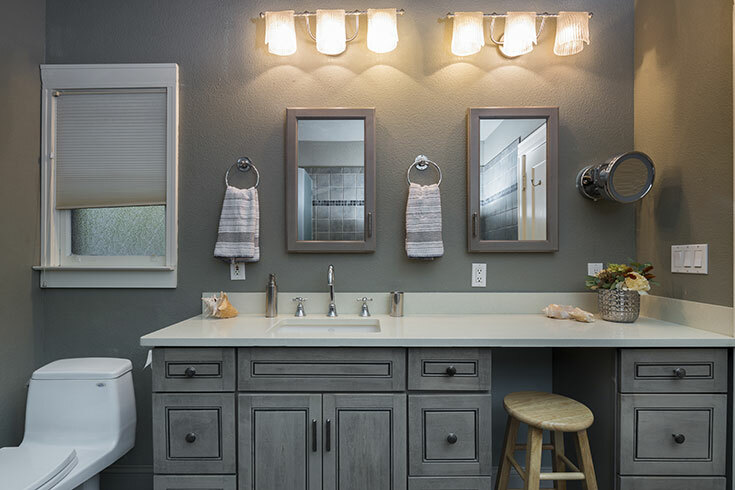 Now you’ve picked the lights and the bulbs for your dream bathroom, all that’s left to do is install them. Electrical work in the bathroom is especially tricky. As you already know, there are IP ratings the bathroom must comply with, but there are also electrical standards installation must follow as well. So all electrical work should be done by a qualified and registered electrician. They might also have practical advice and some extra tips to ensure your lighting is the best it can be. TIP: Word of mouth is often the best way to find a contractor for this kind of job. Ask around about people’s experiences with bathroom renovations, and get details from those with the best reno stories.